How I Gained It: As a child and teen, I was the girl with the “hollow leg.” I was thin from running around outside from morning ’til night. Coming from a large family, I learned to eat when dinner hit the table, hungry or not, because if you waited it might not be there later. Although I stayed thin through my first year in college, I was eating very large volumes of food and maintaining my weight with running, aerobics and weightlifting five days per week. When I got married the next year, I began to exercise less while continuing to eat as much as I could hold. 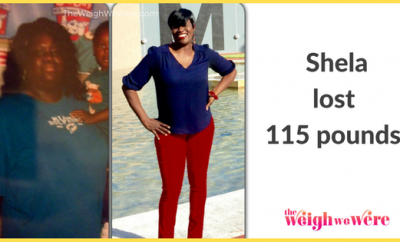 The pounds started to pack on — I gained 25 in the first year of my marriage and a few more each year. I would try things like exercise routines, training for running races, cutting out fat, counting calories, natural and organic meals and vitamins, but nothing worked for more than a few months at a time. 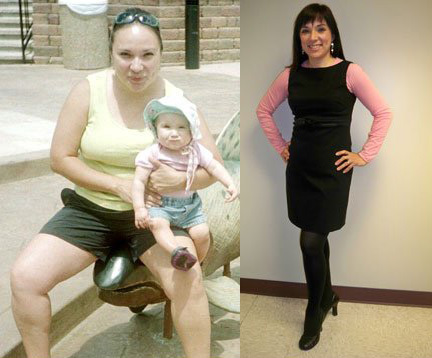 Breaking Point: By the time I entered my 30s, I weighed 173 pounds, and I was keeping that in check with daily exercise. 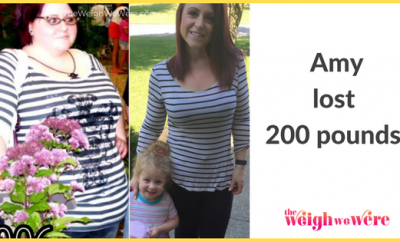 I would wake up every single day with two thoughts: “How am I going to lose this weight,” and, “what am I going to eat today?” While there was not one particular breaking point moment for me, my entire world was consumed with getting the weight off. I had polycystic ovarian syndrome – pcos (an infertility disorder often related to weight). When I was finally able to conceive my first child, my pregnancy was complicated by gestational diabetes. After having my daughter I desperately returned to exercise, bundling her in the jogger and walking for hours a day. Unfortunately, I was still consumed by always wanting food. I would get back from a walk, eat a large lunch and then have a peanut butter and jelly sandwich for dessert. 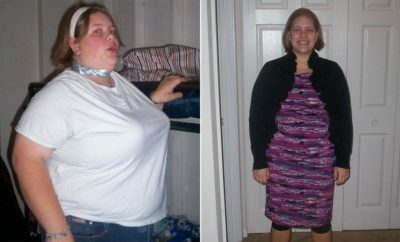 I was truly desperate for answers as to how I could stop overeating and lose the weight. 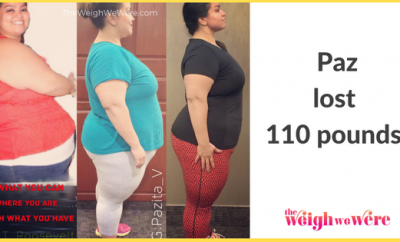 How I Lost It: One day on one of my walks, a neighbor and I got to talking, and she revealed to me that she had lost 80 pounds with a book called The Weigh Down Diet. As soon as I started to read it, I knew it contained the answers I was looking for. The book talked about how diets make you focus more on the food and end up causing you to gain more weight, which was something I was experiencing every day. I kept reading and was so excited — I had revelation after revelation and finally hope. Through the diet, I learned that I should be turning to faith to heal my hurting heart or worried mind instead of turning to food, which was just making me miserable. I began to understand how to put the food in its proper place in my life. The book is packed with practical tips that I began using daily, like slowing down to eat, cutting portions in half, and of course, praying and developing my relationship with God first and foremost. I also signed up for a Weigh Down class — we met once a week and could share and encourage each other. If I had a rough week I could call or email someone at the Weigh Down office for free encouragement. It only took me ten months to lose just over 50 pounds and get back to the size four that I had not been in over 10 years. My infertility problems stopped within two months of reaching my goal weight and I had a wonderful, diabetes-free second pregnancy. My life has completely changed. I eat normal foods like steak, chicken, salad, bread and even sweets and fast food in small amounts. The difference is that I do not even think about food until I feel true physical hunger, and I have learned how to have control and stop when I feel that satisfied feeling. As a result, the amount of food I eat now has drastically changed. I have also returned to my love of being outdoors and now spend my leisure time walking or jogging with friends or chasing my girls at the playground. I have much more energy during the day. My renewed relationship with God has affected every area of my life. My marriage is more at peace and I am a better and more active mother. Larissa has maintained her weight for four years..